Today is a lazy day for me. No uni, no work, just relaxing with my little nephew. This morning I did a couple of hours on my Style Icon work, then my mum made home made vegetable soup ( So yummy on a cold day like this) and then me and Michael my nephew baked these scrummy Christmas biscuits. Yes I know its still November but I’m a big kid and couldn’t resist! They are made with lots of yummy ingredients like golden syrup and cinnamon. The recipe is from a book called ‘The Children’s Cookbook” by Sara Lewis. If anyone is interested in the recipe let me know and I’ll add it to the post at some point! My diary is jam packed at the moment. I have lots of nice things to look forward to! First of all, tomorrow is Payday! I’m meeting friends for lunch and shopping throughout the day, then Dan is back tomorrow night. Weekend is taken up by working but that doesn’t count! On Monday Dan and I are taking my eldest niece and nephew Christmas shopping to the Trafford centre in Manchester, Tuesday is DECEMBER! (Which means yes, I will be putting my tree up in my room, and this year it will be nicer than ever.) and next Friday my mum is coming Christmas shopping with me in the City centre and lunch out! Exciting stuff. Today I’m suddenly excited for Christmas. I can’t wait. 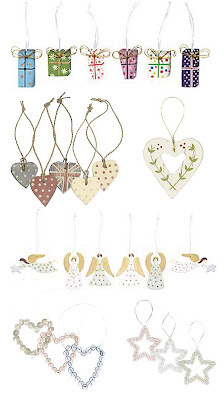 These are the decorations I plan on buying if I can afford to. They are all from John Lewis. How perfect are they for my ROOM!? Find them HERE.